We’re a real xenophobic band of yahoos, especially in these security conscious times. We’re gonna break a vow of silence here and put a contact number or two out to you, but we’re counting on you NOT to divulge this information to our ex-spouses, the IRS and the rest of a surveillance happy government. We know you won’t let us down. If you’re wanting to book the band, call us at 360-387-9395 (Jack Archibald). The call may be monitored by South End Homeland Security, but don’t worry, we always obtain the necessary court orders allowing this surveillance. After all, Al Qaida could use these songs of ours to wreak untold damage on their enemies….. even though the Geneva Convention specifically outlaws torture by fiddle music. Or e-mail us at skeeterdaddle@yahoo.net If you want to buy a CD, check out the info we got under Capitalism’s Last Gasp. (We always advise our few fans to Shop Loco.) 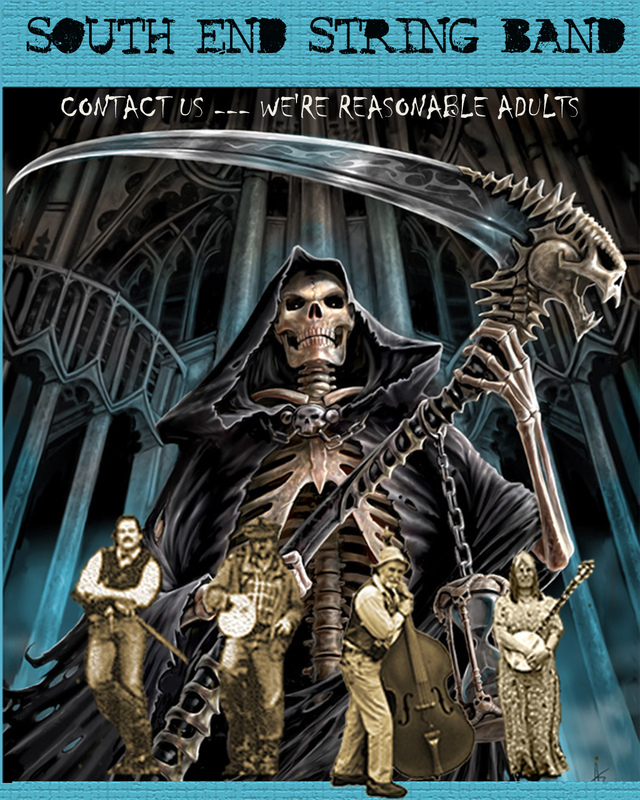 If you want to make a complaint, call our 24 hour hotline: 360-I Hate Banjo. So the Band is more than a musical icon. More even than a Juggernaut of Social Conscience. More than a bastion of fiscal sanity in these spend- but- don’t- tax times. We are the keepers of the fiddle flames. The historians of the South End Chronicles. Think of us as the South End Chamber of Commerce and the Chapel of Common Sense combined. Let’s take a minute or two to introduce our entourage of minstrels here. We usually just pass out resumes and run for the exits, but tonight we’re gonna take some risks. Monika DeNasha’s our 5 string banjo and six string guitar and jawharpist. Bill Gum’s on the standup bass fiddle. Erich Schweiger’s our concert violinist. He makes em too, that and cellos. Hi I am looking to do a benefit at the Camano Country Club in August. I have $300 in funds for the band or we could look at a percent of profits. I am looking at a late Sunday afternoon barbeque. Would you be interested to play for an hour or two. I am also thinking of having some young local talent that would donate their time as a filler. The money would go to the community fitness department at the Country club to help bring in new fitness supplies and equipment. This fund helps seniors and youth to get fit.